Fluorescence is a highly sensitive method for detecting DNA, RNA or proteins. 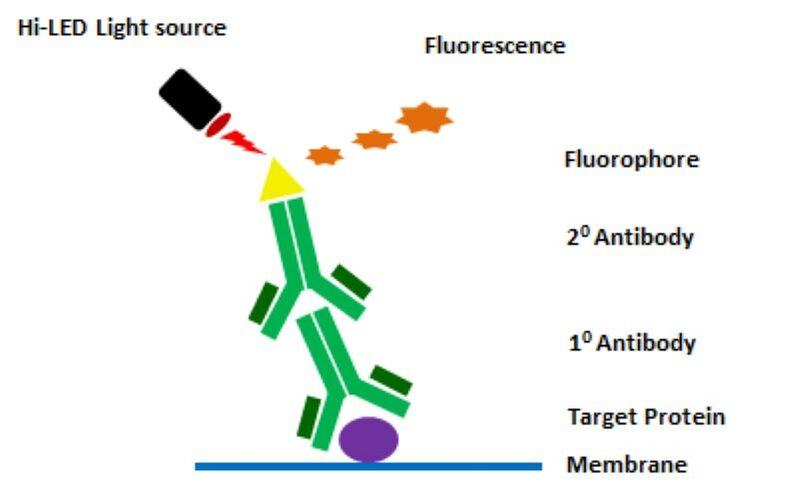 You can either bind fluorescent molecules directly to nucleic acids or proteins or alternatively with proteins, you can attach a fluorophore to a secondary or tertiary antibody that binds to your target protein. To visualise fluorescent molecules, you need to excite them with a high intensity light source such as UV, RGB and IR light. When excited a fluorophore generates light emission as many thousands of detectable photons that you can capture with a CCD camera. 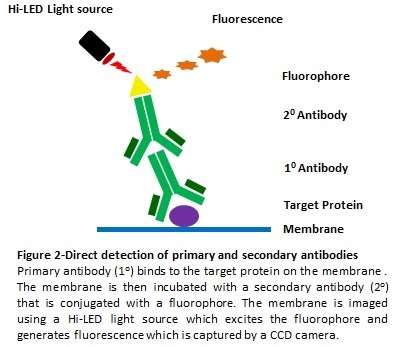 Since fluorescent molecules produce so many photons of light, with the right types of image capture technology, you can detect as little as picogram and femtogram levels of nucleic acids and proteins. 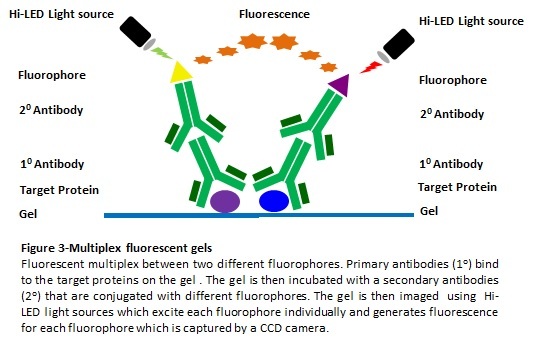 Additionally, as each type of fluorophore produces light in different colours, you can use several fluorescent molecules simultaneously to detect many separate target proteins all on one gel. 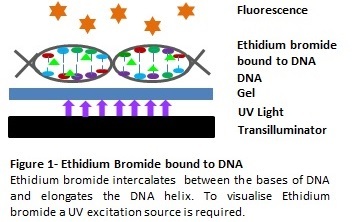 To visualise DNA or RNA on your gels, you would traditionally use ethidium bromide. This binds to nucleic acids and produces fluorescence with UV light. For safer DNA imaging, you can choose less hazardous dyes such as SYBR® Safe, SYBR® Gold, GelRed™, GelGreen™ and SYBR® Green which fluoresce with blue light. Instead of using Coomassie Blue, you can choose AzureRed, Coomassie™ Fluor Orange, SYPRO® Ruby and SYPRO® Red protein stains. 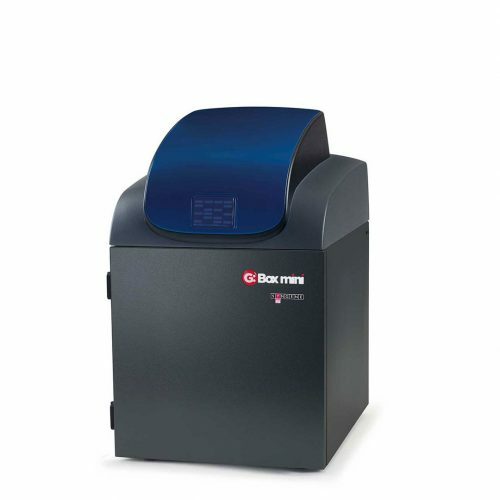 These bind to total protein and produce fluorescence with UV or blue light and you can determine quantitative data from your bands by including protein standards. 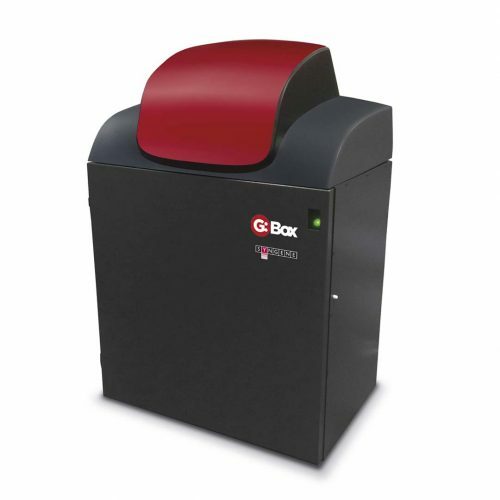 With NuGenius, InGenius, G:BOX or G:BOX mini systems you can easily visualise all these dyes. 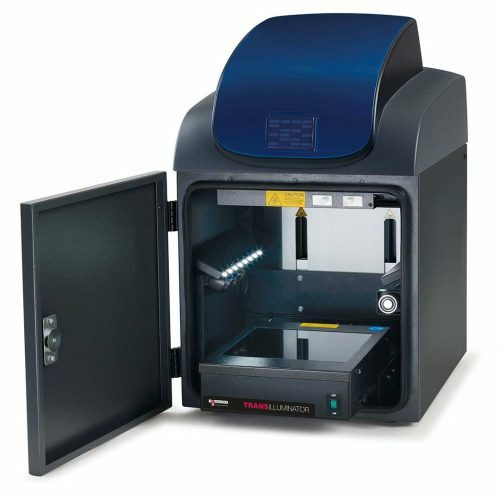 Using a UV transilluminator and UV-blue light converter screen or blue light transilluminator options, you can image fluorescent DNA, RNA or protein in seconds and when you need to cut bands out of your gel, the transilluminator simply slides out for easy access. If you don’t want to do time-consuming staining and de-staining steps to visualise proteins, you can use the increasingly popular Stain-Free™ gels. These gels contain a compound in their matrix which binds to tryptophan residues in the protein and generates fluorescence with UV light. 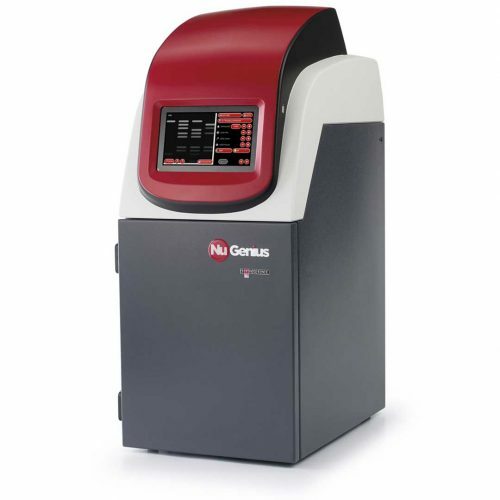 The NuGenius+, G:BOX or G:BOX mini systems have been optimised for quick and easy imaging of Stain-Free™ gels. 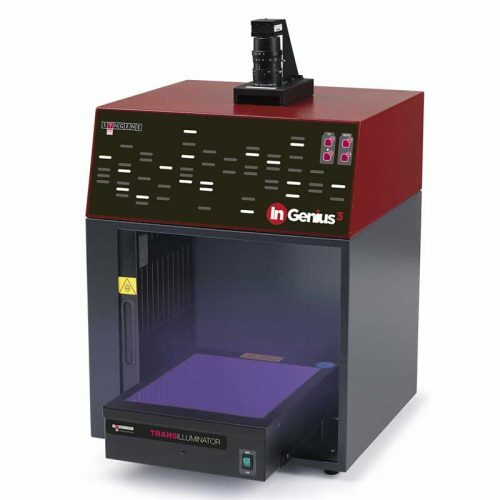 Using UV transilluminator lighting options, each system’s software will select the right imaging conditions for you to get great results every time. With fluorescent western blotting you can attach a fluorophore such as Alexa Fluor®, IRDye®, DyLight™ or Qdot® to a secondary or tertiary antibody that binds to your target protein. Since these dyes emit different coloured light with high intensity UV, RGB or IR lighting, you can use several fluorescent molecules simultaneously to visualise multiple different proteins all on one blot. 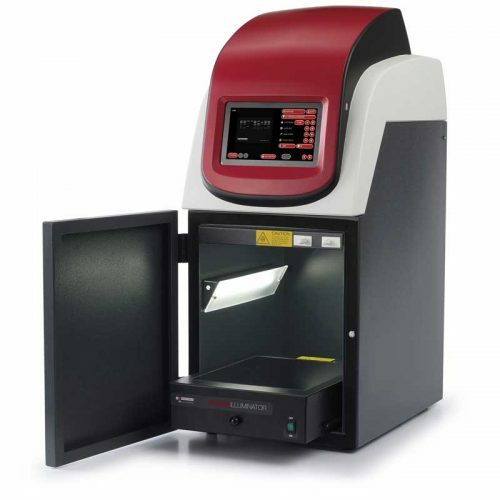 This gives you the flexibility to multiplex, without the loss of signal due to stripping and re-probing your blot and because fluorescent signals have greater stability over time, your results are linear and more accurate. To get away from transferring your proteins to a western blot, you can use secondary antibodies labelled with all the same dyes you would use for fluorescent western blotting directly in the gel to bind to any antibody bound to your target proteins. The dyes fluoresce with RGB or IR lighting, so you can detect fusion proteins and protein-protein interaction, as well as protein-DNA or protein-RNA interactions directly in your gel. 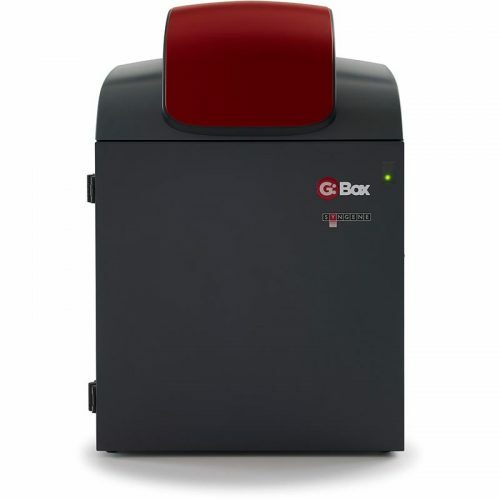 Using specific filters and HI-LED RGB and IR lighting options you can rapidly image multiplex fluorescence proteins on western blots or in gels with the G:BOX or G:BOX mini systems. 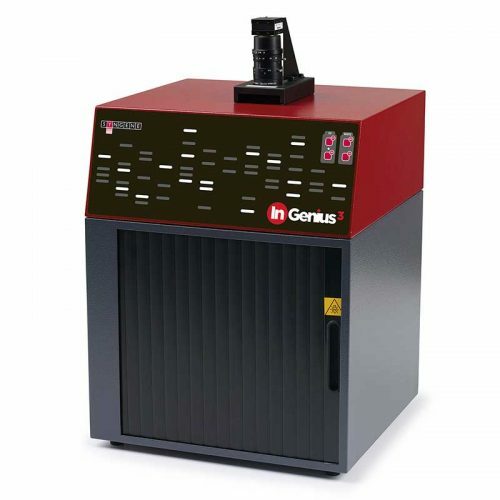 The systems’ GeneSys software automatically selects the best combination of lighting and filters available to image each dye. You can then capture one or multiple images of your blot or gel and overlay different colour images. This means you can produce one complete picture of all your different fluorescent proteins, without having to strip and re-probe a blot, making visualising and analysing each protein accurately, a simple task.